DSA’s Convention – Back to the Democratic Party or an Independent Course? When the Democratic Socialists of America (DSA) meets in convention in Chicago this weekend the central question will be this: Will DSA return to the Democratic Party or chart an independent course? DSA members Joseph M. Schwartz and Bhaskar Sunkara have written an article in which they argue that DSA should follow the example of the Communist Party USA in the Popular Front period of the 1930s when it supported Democratic Party president Franklin D. Roosevelt. by following Moscow’s line on the Hitler-Stalin Pact and then the no-strike pledge during World War II, the party abandoned the most militant sectors of the working class. Thus, the Communists put themselves in a position that prevented them from ever winning hegemony within the US working-class movement from liberal forces. Still, this does not recognize the fundamental problem of that period: the Communist Party of the 1930s and 1940s and throughout the rest of the century, lost its independent political identity and to all intents and purposes became simply a group on the left fringe of the Democratic Party. The CP supported progressive Democrats, but also regular Democrats, and over decades it had no significant impact on the Democratic Party and its capitalist and imperialist policies. The Democratic Party has been the problem of the Left forever. Thanks to William Jennings Bryan, the Populist Party of the 1890s entered the Democratic Party and died there. The Congress of Industrial Organizations (CIO), made up of the unions that had been created by the great labor upheaval from 1934 to 1939 did the same. The black civil rights movement of the 1960s also entered the Democratic Party, where it too passed away. Likewise with the Latino movement and the women’s movement of the 1970s. None of these organizations developed a strategy that would have allowed them to maintain their own political ideology, identity, and organization while sometimes supporting Democrats. All of those movements went into the Democratic Party hook, line, and sinker. And they disappeared for decades. The Democratic Party was also the Achilles heel of DSA from its founding until yesterday, that is until its recent transformation into a mass organization of thousands of young people radicalized by the Sanders campaign and the Trump presidency. Michael Harrington, the leading figure of the predecessor organization the Democratic Socialist Organizing Committee (DSOC) and then of the Democratic Socialists of America, believed that socialists could play a catalytic role in bringing together the civil rights movement, the old CIO labor unions, and the anti-war liberals and drive the big city machines and the racist southern leadership out of the Democratic Party. He sometimes suggested and his followers often interpreted his position as meaning that socialists could reform or even take over the Democratic Party. The result was that by the 1980s and into the 1990s DSA members supported not only progressive Democrats but also regular Democrats. 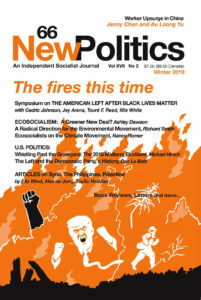 At the same time, it should be pointed out that for decades other leftists worked on building independent political parties to the left of Democrats: the Peace & Freedom Party since 1968, environmentalist Barry Commoner’s Citizens Party, the Green Party, the Labor Party led by Tony Mazzocchi of the Oil, Chemical and Atomic Workers Union, and any number of socialist parties and candidacies (including my own for the U.S. Senate in Ohio in 2010). Clearly this strategy proved to be no more successful than working in the Democratic Party. The best of these efforts over 50 years was that of Ralph Nader and Winona Duke in 2000, which won only 2.7 percent of the vote. So, like the CP and DSA strategy of working in the Democratic Party, this version of independent political action also failed. DSA’s new members, I believe, do not want to reenact the history of either the Communist Party or of the early DSA. Nor are they interested in the Green Party. Bernie Sanders' campaign—on which so many of us worked together—inspired them. They came to hate Debbie Wasserman-Schultz and the Democratic National Committee (DNC) for their treatment of Sanders. Many would not vote for Hillary Clinton whom they correctly viewed as the candidate of the American capitalist establishment. Of course, they hated Trump, rightly feared him, and wanted to fight him, so they joined DSA. DSA’s members have become part of the Resistance, but many and perhaps most of us want to resist not only Trump, but also the Clinton-Obama wing of the party. We are certainly not looking forward to the rise of Kamala Harris, now anointed by Clinton money and the media machine. What then should DSA do? DSA’s first responsibility, of course, is to build the labor and social movements. If we are to challenge capitalism and the United States government, we will need a much higher level of class struggle. We cannot create that—only economic and political conditions can—but we can contribute to it. We want the Resistance movement to develop its own independent political identity, separate from the Democratic Party and the progressive groups with which we will work such as Indivisible, MoveOn.org, and Our Revolution. Schwartz and Sunkara criticize the Democratic Party’s neoliberal—that is, economically conservative, politics—and that’s all well and good. But we in DSA much also criticize the progressive organizations, which will be both our sometime allies but also our competitors. We must make it clear to our members, even while working with the progressive groups, that we are socialists not Democrats, and that we have our own political agenda. Should we support progressive Democrats? We should only if they make clear their opposition to American imperialism, their criticisms of the financial and corporate system, their refusal to accept corporate money, or to accept any support from corporate Democrats, their financial networks, and their PACs. We should, of course, also support candidates who run as open socialists in the Democratic Party or in some cases outside of the Democratic Party. Or we might support Green Party or other independent candidacies. We should do so, however, only while building our own political organization. The most political issue facing DSA today is the development its own independent political ideology and organization, whether it is supporting the rare, genuine progressive or supporting socialist or other left candidates. As we enter the congressional election season in 2018 and later the presidential election period of 2020, there will be tremendous pressure on DSA and others on the left to back progressive Democrats; and if and when the progressives lose thee will be pressure to ourselves into the campaigns of corporate Democrats who can be counted on to frustrate the needs and desires of working people and the poor. We must resist the tendency to be carried by the progressives back into the Democratic Party, which is dominated by the banks and corporations. We should not participate in the internal life of the Democratic Party and we must steer clear of the party’s financial resources that can only have a corrupting influence on DSA. For many years, DSA had the reputation of being simply another progressive group in the Democratic Party. It is time for DSA to assert its independence and to adopt its own political identity as a radical socialist organization. At its convention, we in DSA should make clear that while working in coalition with groups such as MoveOn.org, Our Revolution, and Indivisible, we have different aims. Or goal is the abolition of capitalism, of the banks and corporations, and the creation of socialism. We should understand that the central issue for DSA at this time is our ability to compete with those groups for the hundreds of thousands of newly radicalized young people. We should offer them a socialist alternative, not a liberal or progressive agenda. Or self-definition as socialists who stand with our own program to the left of the progressives will give DSA a strong, new political identity around which our membership can cohere as we become a mass socialist party that can begin to challenge capitalism. *Dan La Botz is a New York City delegate to the DSA Convention and a candidate for DSA's National Political Committee. When responding to the challenges that my twin teenage daughters faced as they were navigating their independent adult world, I always counseled: chart your own course. Chart your own course meant to take independent action, not get tangled in other people’s bad behavior, not get sucked into other’s drama, not get dissuaded by setbacks, not get discouraged by self doubt. Chart your own course. I commend the analysis. I believe it to be timely and important. Dan writes that DSA members must be tribunes for socialism. I agree this is the crucial role but would suggest it runs counter to electoral popularity. It should in fact be purely antagonistic, a radical truth-telling “tribune” in total opposition to the ideology of the status quo (liberal or conservative). The most unpopular truth is the contradiction between economic growth and ecological survival, a truth even the most “progressive” Democrat cannot, must not, utter. In other words, let the sparks fly (or we will never see the fire next time) but don’t expect to win many seats in the capitalist state. The Bolivarian project of Venezuela is just the latest example of an historical reality; you cannot elect socialism in one country.